The plan was for Jackson Hole to be a vacation home, a place where Chad and Edward could escape the busyness of San Francisco and their lives in the city’s trendy Noe Valley neighborhood. “I thought we’d get bored if we were in Jackson full-time,” says Edward, who works in corporate financial consulting. “But every time we were at the Jackson airport flying home to San Francisco, I didn’t want to leave.” Chad, a former advertising director who now cares for the couple’s toddler twins, Violet Genevieve and Ethan Bennett, says, “I almost had a hangover every time I went back to San Francisco. That’s when we knew we loved Jackson, and it was our home.” This realization came after the couple bought their vacation home here, though. “We looked at about a dozen houses,” Chad says. “When we started looking, we thought a condo would be great—you can lock the door when you leave and not worry about it—but the condo that we really liked had zero outdoor space and overlooked the jail. We already had a house in the city. 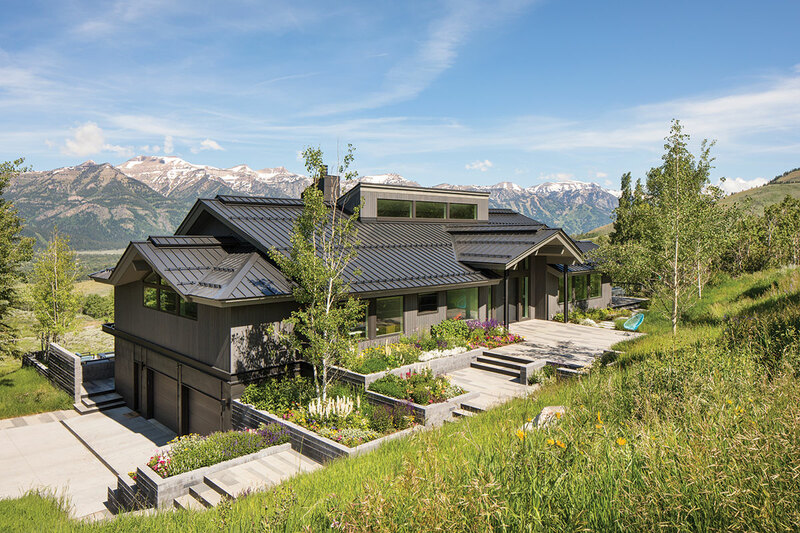 We decided that if we were going to live here, we needed something with space.” The couple looked at houses all over the valley—from Teton Village to Wilson to South Park—before settling on a home built in 1993 on seven acres on West Gros Ventre Butte. The house, which was designed by Ellis Nunn and Danny Egan, was not love at first sight. “Edward liked it more than I did initially,” Chad says. “I had a harder time getting past the pickle-bleached oak and pink. The snarky me would describe the decor as ‘Golden Girls meets early 1990s condo in Boca, meets the mountains,’ and I had an issue coming from a 1,200-square-foot house in San Francisco to 5,000 square feet. I thought it was way too big of a house for us.” Edward immediately saw the home’s possibility, though. “For being designed and built in the nineties, it was pretty contemporary with high ceilings and lots of light in the great room,” he says. Chad and Edward spent time in the home for a year. “We wanted to find out what we liked and what we didn’t,” Edward says. 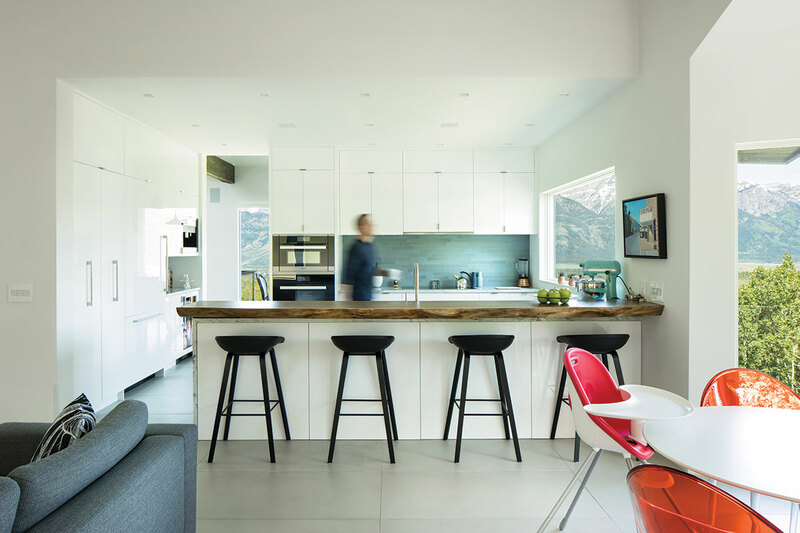 Once they had ideas of what they wanted to do, the couple went directly to Carney Logan Burke Architects (CLBA); they had seen a condo the firm did and knew they liked their style. The couple and CLBA worked on designs for about one year, redoing everything. “Nothing of the original house, outside of the footprint itself, was left untouched,” Chad says. Walls were knocked out, a new staircase was manufactured, windows were added, and doors were put in downstairs guest rooms for direct outdoor access. The men made the kitchen all white, “despite the contractor trying to talk us out of it,” Edward says. Chad found one online wallpaper company who had it, but it was listed as unavailable. The mother (who lived in Sydney) of CLBA’s Australian-born interior designer Sarah Kennedy “found the one roll that was left,” Chad says. One roll was exactly the amount needed to cover one wall in the media room. The wallpaper in Edward’s office is custom and is the easiest way to see the couple’s pleasure in personal touches and attention to detail. The print is lifelike and of a bookshelf. On the wallpaper’s “shelves” are favorite books of the couple’s, photographs of Chad’s dad and his twin brother as babies and a photo of Chad’s grandmother from the 1940s, Edward’s bronzed baby shoe, a pair of Chad’s childhood sneakers, a replica of a roadside attraction from Chad’s hometown in Wisconsin, and even some superhero action figures from Chad’s collections. “It took time and effort to make this happen, but it was fun and worth it,” Chad says. “Even if this isn’t Edward’s office anymore right now.” This office became the bedroom of Violet and Ethan when they were born in July 2016. It looks like a bookshelf, but this wall in Edward’s office is wallpaper. 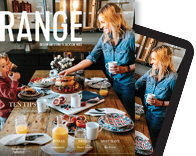 Chad and Edward styled a bookshelf with the help of John Frechette and Christian Burch of Mountain Dandy Showroom. Chad and Edward incorporated favorite books and family mementoes. Jackson Hole-based photographer Tuck Fauntleroy then shot the styled shelves and sent the images off to Flavor Paper in Brooklyn, New York, which specializes in custom wallpaper. In the kitchen, Falls Cabinet and Millwork fabricated custom white lacquer cabinets. The owners picked an Eero Saarinen (by Knoll) kitchen table, highchairs by Phil & Teds, and Kartell’s “Mr. Super Impossible” chairs. The painting of the former Teton Theatre is by Jackson-based artist Travis Walker. The black wood and leather barstools are by Hee Welling for Hay, and the subway tiles in the backsplash are from Heath Ceramics. 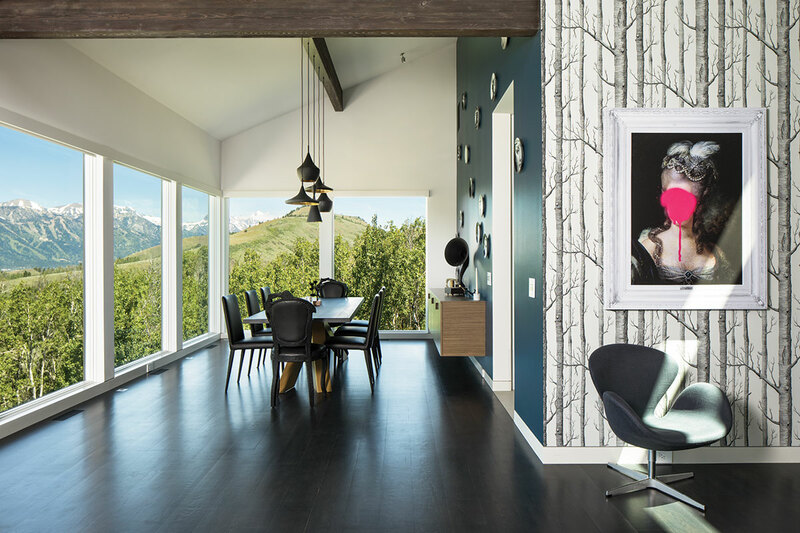 In the living/dining room, Chad and Edward paired the quirky digital print Madame Blush by designers Brendan Young and Vanessa Battaglia (working together as Minehart) with Cole and Son’s “woods” wallpaper and went with a Nido dining table. Dining chairs are from Nido and Moooi. 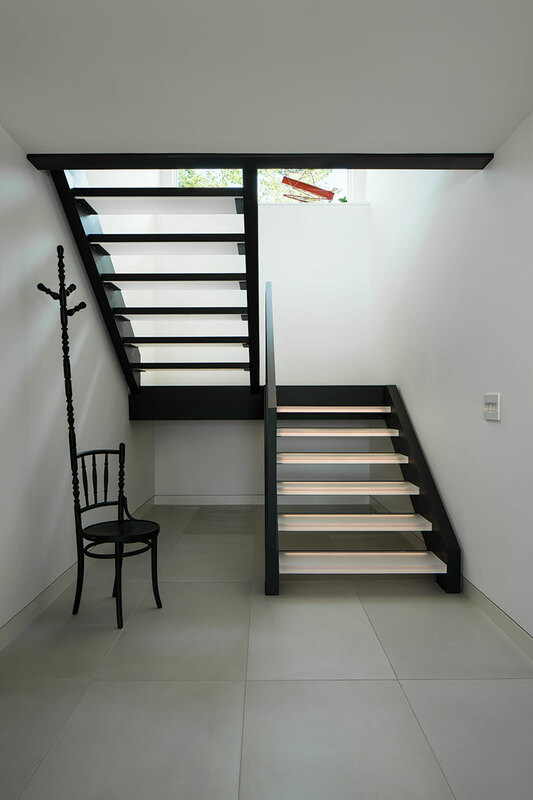 Sjoerd Vroonland for Moooi’s “extension chair” sits at the base of custom underlit, translucent stairs by 3form. In a powder room, Tom Dixon “Melt” minipendants in chrome hang above a custom vanity in walnut made by Falls Cabinet and Millwork. The tiles are a nod to the couple’s history with San Francisco. Made by Subway Ceramics, the tiles are replicas of the hexagonal dome subway tiles used in San Francisco’s BART stations in 1973. 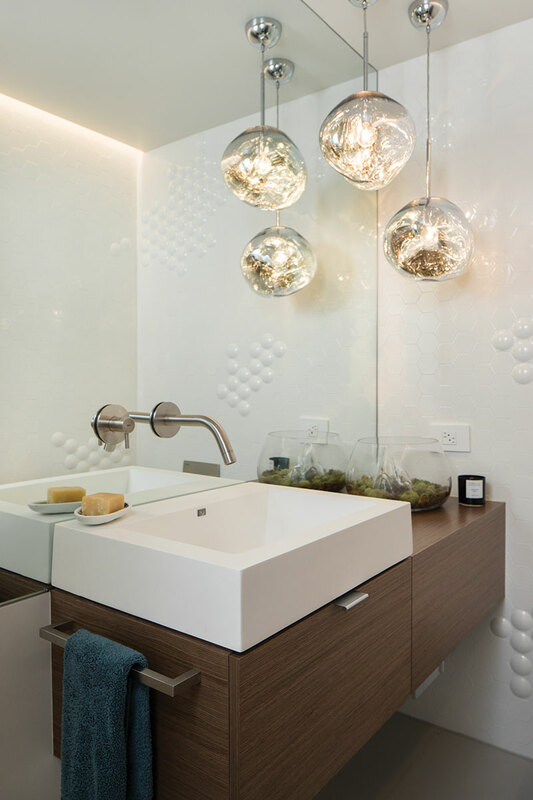 San Francisco architect Kelly Melendez designed the tiles’ random pattern. Chad first saw this Catherine Martin wallpaper in a hotel in Sydney, Australia, while traveling for business. 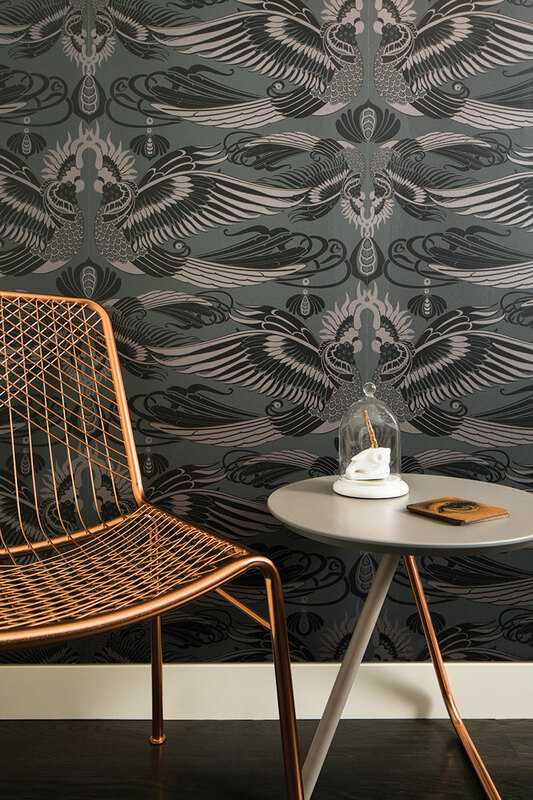 Also in the media room are a wood and copper table from Leitmotiv, a copper chair from CB2, and a unicorn skull bell jar by Imm Living. A mixed media piece by Dolan Geiman, a native of Virginia’s Shenandoah Valley, hangs in the master bedroom. Chad and Edward found it at an art fair in Sausalito, California. “As soon as we saw it, we knew it’d be perfect in this house,” Chad says. 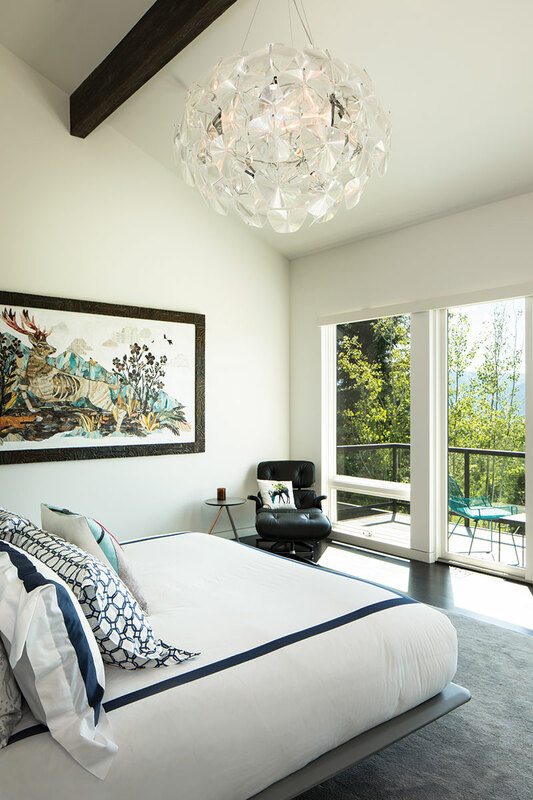 The lighting fixture above Italian Collection’s “Wing” acrylic and leather platform bed is Luceplan’s “Hope” suspension pendant. Bedding is by Sferra.